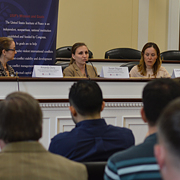 On July 29, two participants in Partnership for a Secure America’s Congressional Partnership Program hosted an off-the-record discussion with Ambassador Ronald E. Neumann to share his observations and insights following his recent trip to Afghanistan. This conversation discussed a responsible path forward in Afghanistan. Formerly a Deputy Assistant Secretary Ronald E. Neumann served three times as Ambassador; to Algeria, Bahrain and finally to the Islamic Republic of Afghanistan from July 2005 to April 2007. Before Afghanistan, Mr. Neumann, a career member of the Senior Foreign Service, served in Baghdad from February 2004 with the Coalition Provisional Authority and then as Embassy Baghdad’s principal interlocutor with the Multinational Command, where he was deeply involved in coordinating the political part of military action. Prior to working in Iraq, he was Chief of Mission in Manama, Bahrain (2001-2004). Before that, Ambassador Neumann served as a Deputy Assistant Secretary in the Bureau of Near East Affairs (1997-2000), where he directed the organization of the first separately-funded NEA democracy programs and also was responsible for the bureau’s work in developing the North African Economic Initiative for Morocco, Tunisia, and Algeria. Before that assignment, he was Ambassador to Algeria (1994 to 1997) and Director of the Office of Northern Gulf Affairs (Iran and Iraq; 1991 to 1994). Earlier in his career, he was Deputy Chief of Mission in Abu Dhabi, United Arab Emirates, and in Sanaa in Yemen, Principal Officer in Tabriz, Iran and Economic/Commercial Officer in Dakar, Senegal. His previous Washington assignments include service as Jordan Desk officer, Staff Assistant in the Middle East (NEA) Bureau, and Political Officer in the Office of Southern European Affairs. Ambassador Neumann is the author of The Other War: Winning and Losing in Afghanistan (Potomac Press, 2009), a book on his time in Afghanistan. He is the author of a number of monographs and articles. At the Academy he has focused particularly on efforts to expand State and USAID personnel to enable these institutions to carry out their responsibilities. Ambassador Neumann speaks some Arabic and Dari as well as French. He received State Department Senior Foreign Service pay awards in 2004, 2003, and 1999 as well as individual Superior Honor Awards in 1993 and 1990. He served as an Army infantry officer in Viet Nam and holds a Bronze Star, Army Commendation Medal and Combat Infantry Badge. In Baghdad, he was awarded the Army Outstanding Civilian Service Medal. He earned a B.A. in history and an M.A. in political science from the University of California at Riverside. He is married to the former M. Elaine Grimm. They have two children.